Here you can find answers to some of the most frequently asked questions about Orsenna and our products. If you have a question not answered on this page, you can ask it to support@orsenna.com. How do I get support if I can’t find an answer here ? In order to provide you support about the WhatsUp plugins, Orsenna need you to get the Debug information of the concerned plugin. 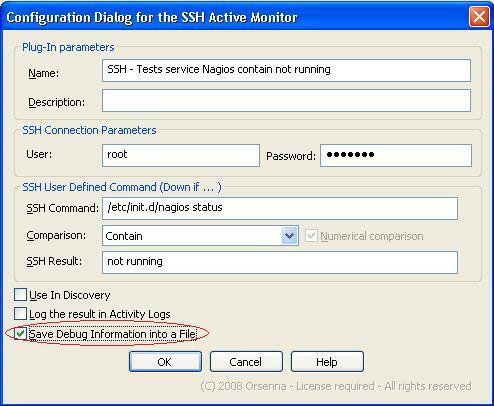 In order to do so, you need to check the “Save Debug Information to a file” in the Active Monitor DialogBox of the plugin you have a problem with. When you think the text file has enough information, you can get it in the installation folder. The name is function of the Plugin. For example, if you want to submit a problem concerning SSH, the file will be named MonSSH_Debug.txt. Send the Debug file at support@orsenna.com and we will get back to you as soon as possible.